Circa 1880. Catering to adults, this recently renovated 1880 Victorian inn graces one acre of the Strip in the state's first resort village. It is listed in the National Register, noted as significantly reflecting the dominant recreation history of Geneva On The Lake. Enjoy the relaxed atmosphere while sitting on white wicker cushioned chairs and rockers or a porch swing. Elegantly functional guest bedrooms and a suite offer views of the Strip and lake. The cottages are situated privately in the back. Savor a satisfying daily breakfast. Magnificent sunsets are best viewed from the inn's easy beach access. Sip a local wine from famed Ashtabula County while chatting by the fireplace. Visit the nearby Jenny Munger Museum. Payment Types Accepted Include American Express, Visa, Discover and Master Card. This property has 6 total guest accommodations with private bath, 3 total suites, including 2 two-bedroom suites and 4 four-bedroom suites and 3 cottages. 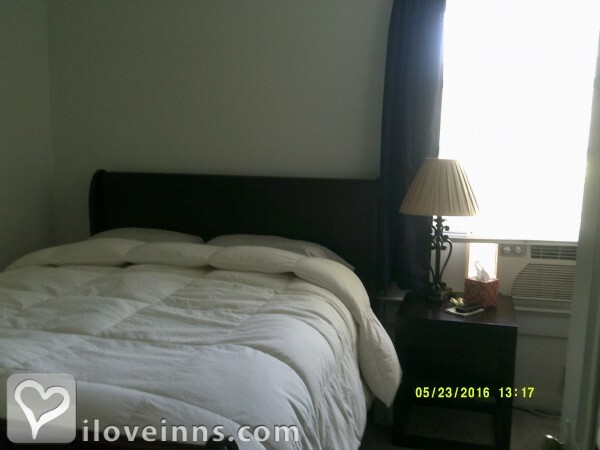 The types of beds available include King, Queen and Twin. 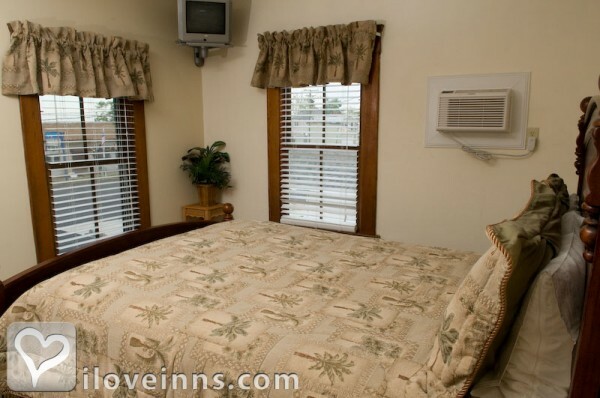 Inn Adults Only - Large wrap-around front porch to people watch & private beach access for evening sunsets. Two-night minimum on weekends. Three-night minimum on holidays. All cancellations made one weeks prior to the arrival date will receive a full refund, less the first night rental fee per room and/or cottage reserved. Cancellations received within one week of arrival will forfeit the entire deposit. No exceptions, please. This also applies to early departures. Lake Front Restaurant, FireHouse Winery & Restaurant, Alessandro's Italian Restaurant. The dates this property will honor the certificate are mid-May through mid-October, Sunday-Thursday, excludes holidays. Our stay was just like something out of a Hallmark movie! We visited the area for a class reunion and will return next summer for the hospitality! Had a Blast! Fabulous Place! We stayed from 9/17 - 9/20/17. 3 Wonderful Nights. Lu and staff were so nice and the place is immaculate and accommodating. We loved sitting on the porch - sometimes enjoying other guests - sometimes all to ourselves. The fire pit out back was a great place to meet people also. We rode our motorcycles, and they let us park them in a large garage when we weren't riding. Breakfasts were fabulous. Took a wine tour with a driver. Couldn't have asked for a better time! We'll be back! Thank you Lu! (Sorry Jerry was away - hope to hear his guitar playing next time). Let's just say there was a mishap and Jerry and Lue went over and beyond expectations to get the problem solved. The Bed and Breakfeast has such a great home like feeling, I felt very comfortable. Very clean. Perfect place to spend an anniversary. We will be back. Thank You again. On this stip but on the end so you're not right in the middle of all the craziness in the middle of the night. 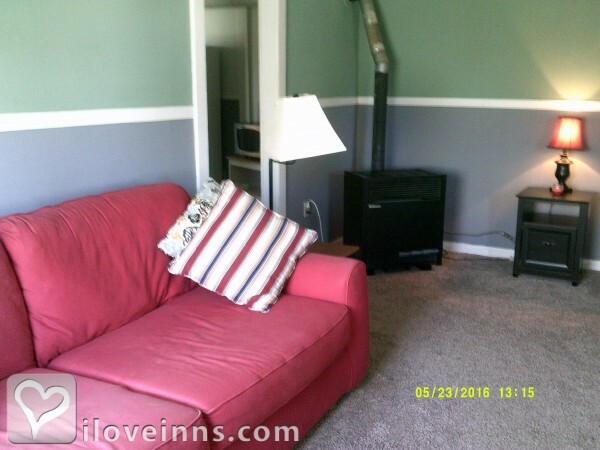 Walking distance to 2 winerys. Very good breakfast, excellent hosts! This B&B is a must see! We have returned to the Beach Club for our 2nd stay. We had so much fun, and truly would not stay anywhere else! We will continue to choose Beach Club for the comfort, cleanliness, and romantic atmosphere. The best there is on the GOTL strip and elsewhere! This was the best Bed & Breakfast we have ever visited. Lou & Jerry are great host. Very comfortable & clean. Beds & pillows comfy. Private bath a plus. Large & yummy breakfast served every morn.& homemade snacks in the afternoon. Watching people, motorcycles, & clasic cars from the huge porch was fun. most relaxed my wife have ever been. jery and lu are two of the greatest hosts you could ever ask for. looking forward to going back in july. This is a warm, comfortable, clean and relaxing Inn. Whether you like to just linger in your beautifully decorated room, sit in the cozy library and read a book, visit by the fireplace in the main parlor and enjoy a wonderful homemade breakfast or Lu's brownies, take a leisurly stroll by the lake or visit the nearby shops or just sit on the porch and watch the world go by (and if your lucky be able to listen to the innkeeper Jerry play his guitar and sing a few tunes) you'll enjoy every minute of your visit! 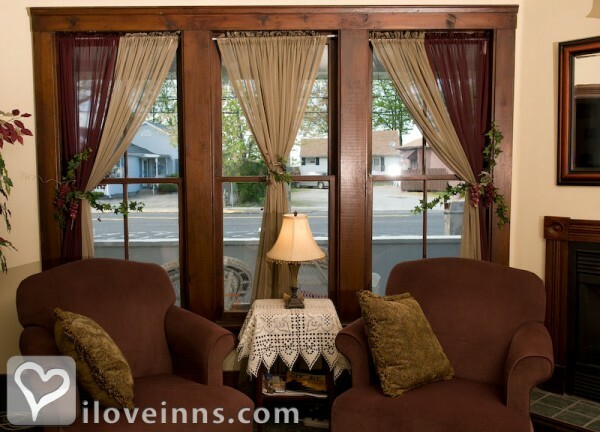 We love this Inn and the innkeepers could not be friendlier or more welcoming! It is very elegant yet still very comfy. The beds are soft and comfortable. The rooms are very nicely decorated. The food is delicious. The atmosphere is calming and comfortable. The location near the lake is superb. The service was great. This is one the finest inns in the area. 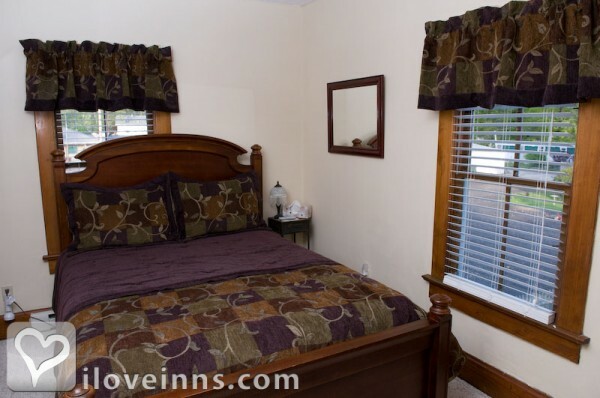 From the beautiful, homey, parlour and sitting room with a lovely dining area, to the comfortable bedrooms that are impeccably clean and cared for, there are few to match the quality of this inn. The hosts are extremely attentive and friendly. 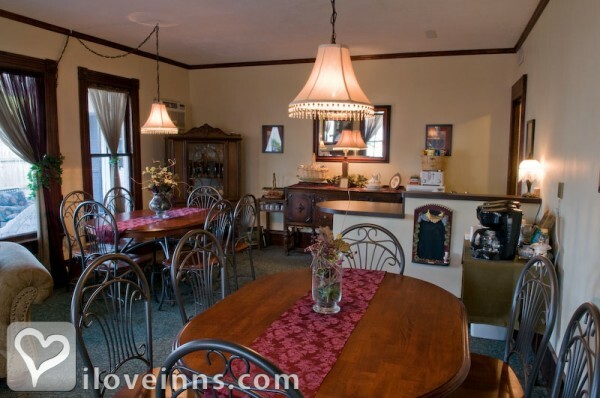 This family-owned bed and breakfast is a wonderful place to vacation. Whether you enjoy boating on Lake Erie, eating at great restaurants, playing mini-golf or riding amusement rides with the kids, or just taking a lovely stroll with that special someone this is the place you are looking for. 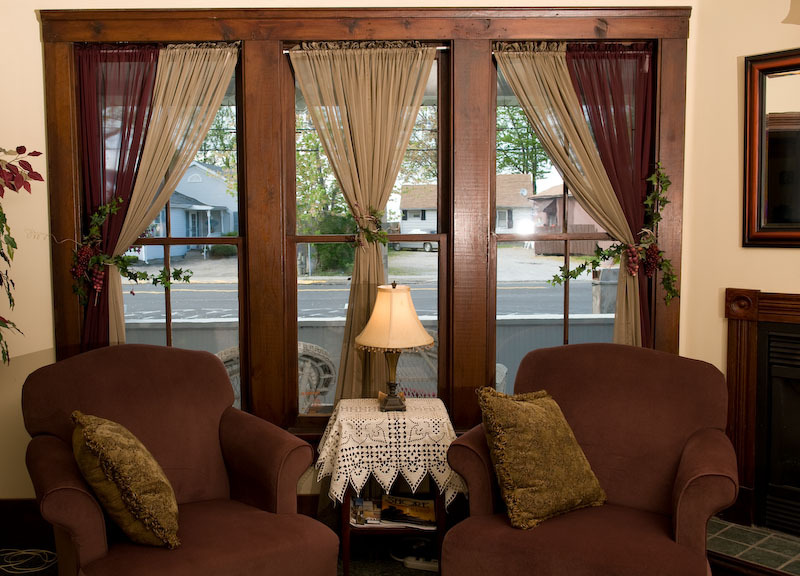 Eagle Cliff Inn offers sparkling clean and beautifully decorated rooms, delicious homemade breakfast, and a wonderful parlor to relax. The atmosphere was awesome and the food was great! Very good service, clean, and very good location. Very cozy & quaint place. Had such a homelike atmosphere. Food was great. I would highly recommend this place. South River Winery for excellent dry wines Ferrante for upscale dining and music on the patio Lake House for awesome sunsets over Lake Erie and upscale dining on an open air patio. This is the first time my husband and I have visited Geneva on the Lake and I can't even begin to say how pleased with our with our trip. Especially the choice to stay at Lu & Jerry's beautiful home, Eagle Cliff Inn. It's in a great location, clean, beautiful furnishings, comfortable, breakfast is delicious and Lu & Jerry are full of ideas to make your trip exactly what you need and want. We can't wait to come back and see our new friends in GOTL. Thanks so much for making this a weekend we'll never forget. Geneva will miss Jeff:)! The owners and the facility are second to none. We are planning our third stay ....WE LOVE IT ! My husband and I spent a night here in October. Geneva on Lake pretty quiet that time of year but the weather was beautiful and the Inn was so comfortable. Breakfast was hot and delicious and plentiful! A True value and much nicer than our second night we spent down the road. I have been staying in one of their Fiesta cottages for about the past ten years. They are the only cottages I will stay at in Geneva. Lou and Jerry are always wonderful, accommodating and welcoming. The cottages are small, but clean and cozy. The have many nice amenities, such as a screened in front porch, fire pit, a grill and full kitchen to utilize. The courtyard offers peace away from the bustle and noise of the strip and I have always found it to be fairly quiet and relaxing. And while they may be located towards one end of the strip, it�s only a pleasant walk to get to the Firehouse and other places. I will be coming back for sure! Outstanding bed and breakfast! The check-in process was smooth and the rooms were immaculate and very comfortable. Small kitchens were quaint yet fully functional. The breakfast was delicious and plentiful. The Innkeepers were very tentative and very lovely. They made us feel very welcome. We rented a cottage over the weekend, we had attended my friends sons wedding. The cottage was clean, had great amenities, a/c, tv, full kitchen and bath. Great screened in porch. The owners are friendly and very helpful, they even gave us a ride to the wedding in their golf cart. Hats off to Terry and LuAnn, thanks for the great time, we WILL be back!! The Inn was charming and very comfortable. Our visit began with a tour and suggestions on places to visit. Breakfasts were varied and delicious. There was always something left to nibble later. The room was clean and comfortable.Wonderful bed! Lu and Jerry and their staff were friendly and always helpful. We loved our two nights at Eagle Cliff Inn. It was our first experience at a Bed & Breakfast, so any other will have to live up to this. Great weekend at the Eagle Cliff !! Within minutes of checking in, the innkeepers, Jerry & Lu, had introduced themselves and made us feel welcome. The Inn is very clean, warm & comfortable, like being at home !!! We will definitely make a return visit soon!!! We stayed here in July, 2013. Lu and Jerry have created a charming, welcoming, private oasis right in Geneva on the Lake. You'll feel at home from the moment you walk onto the large front porch. The rooms are beautifully decorated, the beds are heavenly and the bathrooms are spacious. The owner's' love for their place shines through in every detail. We enjoyed a relaxing evening on the porch in comfy rockers, sipping wine while enjoying the breeze and talking with the other guests. Breakfast was delicious. Our only regret was that we weren't staying longer. Thank you Lu and Jerry! On July 31,2013, my husband and I decided to take our mothers on a very much needed getaway. What we experienced was more than we bargained for. As Jerry and Lu were 2 extraordinary christian people. They welcomed us and our mothers in a very personal way. Within the first day we felt as we had known them most of our lives. They sat and ate with us, even entertained us. For a first time experience with our mothers they are looking forward to going back. Our mothers are still talking about their trip. 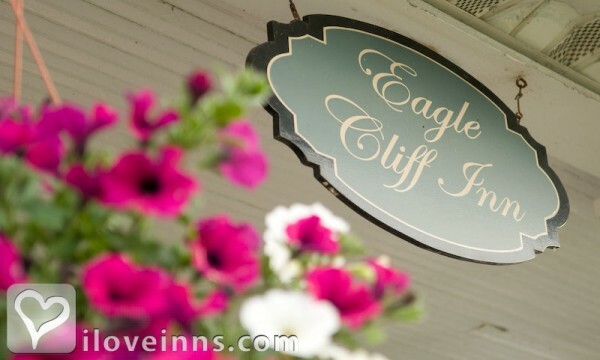 We would highly recommend Eagle Cliff Inn for your next getaway. We have spent a weekend for the past two years at Eagle Cliff Inn. The owners, Jerry and Lu, are a wonderful couple that are more like friends than business owners. The Inn is very clean and the breakfast is delicious. I especially like the front porch where you can enjoy a hot cup of coffee in the morning and a cold beer or glass of wine in the evening. The Inn is also close to many wineries. We will be back soon. Romantic and fun filled get away! My husband and I stayed at the Eagle Cliff Inn for 9 days at the end of July to the first part of August and I just want to say it is an amazing Inn. There are no children in this Adult only Inn which is wonderful! As someone who has 7 kids and 9 grandchildren that I adore, I appreciated the peace and quiet of the Inn. It's a romantic setting as well as fun. 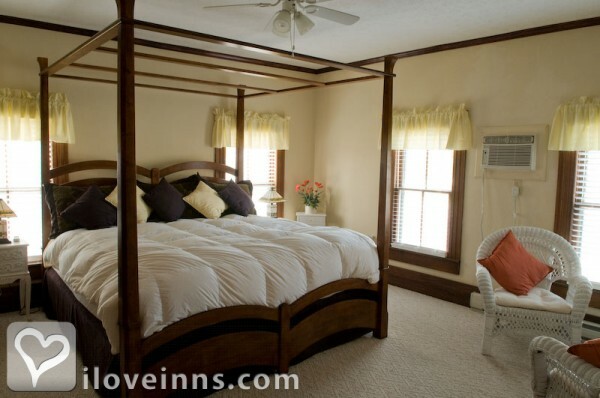 The Inn itself has been lovingly restored and is just beautiful, the place is clean and the beds are comfortable. The breakfast is an amazing hot feast every morning, and I mean a feast! Along with complimentary coffee, (both brewed and Kuerig), there is a stocked fridge with water and wine throughout the day and evenings. Snacks are sometimes even put out for your enjoyment. The Inn is located on the beautiful Geneva on the Lake strip right on Lake Erie, with everything available within a minutes walk. But the Inn itself is at the quiet end of the strip. Lu and Jerry are the perfect hosts too. The wrap around front porch is one of the most inviting things about it. It stretches all the way around and is the hub of entertainment on many evenings. We could sit and meet other guests and get to know people from all over, chat over a glass of wine or coffee and enjoy the evening. And being located on the strip we also got to watch the "passerbys" which is always so much fun. 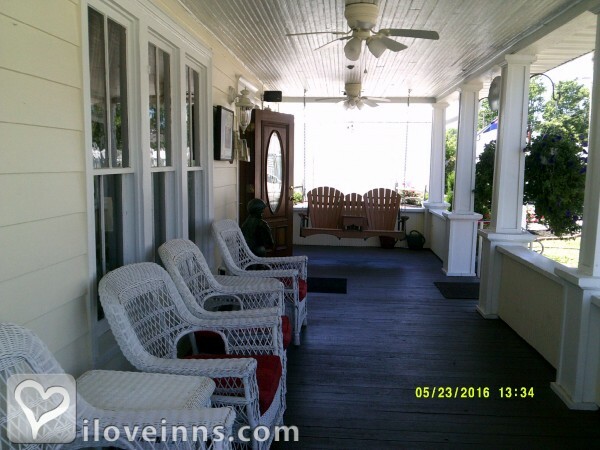 The Innkeepers are so friendly and sometimes will sit with their guests and chat on the front porch. Be sure to ask Jerry to play a tune for you as he is an talented musician and artist. (We bought one of his paintings of the Inn). Thanks Lu and Jerry for a great stay! Make an Effort to Stay Here!! 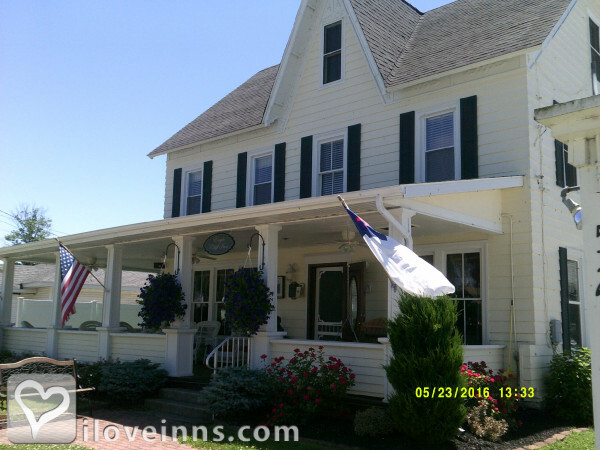 Wanting to spend some time on Lake Erie I chose this inn and surely wasn't disappointed. Great place to stay in a beautiful area. My friend and I went to some wineries, toured some covered bridges and did the antique thing in Geneva. The kindness of Lu and her staff is wonderful. Sitting on the front porch in September is very relaxing. I even sat there one night with my crocheting and thought "This is the Best'. I took my sister, daughter and daughter in law for a girls get away to celebrate my sisters recent completion of chemo therapy. The Eagles Cliff was the perfect place to go. Great food, great rooms and a wonderful opportunity to meet some exciting new friends. We all can't wait to go back next year! Thank you Lu and your wonderful staff for making us feel like family. owners were wonderful. wrap around porch is conducive to great conversation, if you so choose. Room was immaculate and breakfast was fresh and just made. I could have spent 2 days just sitting on the porch and talking with all the guests and the owners. We had a great time and are going back, in August. My husband & I stayed from June 8 thru June 11, 2014. The cottage was the perfect size for 2 adults. It was cozy & VERY CLEAN!!. The queen size bed was very comfy! Almost everything you need to stay is provided except for your clothing & food! The owner's are also very nice! It is an easy walk to everything happening on the strip. We discovered our travels brought us close to Eagles Cliff Inn ,so we made a detour from our trip to revisit the Inn. Fortunately there was room. We have never experienced a more friendly and warm staff. We have stayed in a cottage and the Inn and found them to be clean and comfortable. The breakfast was 1st rate. This was the first time I stayed with the Eagle Cliff Inn and was blown away by how clean and well kept the Inn was. The rooms were all done up very nicely, the laundry was fresh/white/clean and available at all times. The staff was amazing/courteous/friendly and just plain wonderful all around. The breakfast both mornings I stayed there was not only hot, but THEE most delicious meal I've tasted in a long time! im so impressed with them, and I would stay there again in a heartbeat. The location is right off the strip there, but when you are in the Inn and in your bedroom, you don't hear a thing. I'm so glad we picked there to stay. It truly is like home.